The room is calm.Please relax and have a rest. Time to relax and relax. Please forget the daily bustle for a while and spend a relaxing time. Room No. 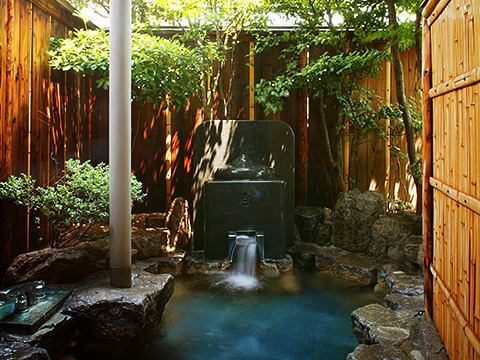 701 is a room with a popular open-air bath, Dogo-kan, familiar for the nickname of "Edo Jocho-no-yu". It becomes a special room even in the room with outdoor bath.The round cobble stone in the garden feels a nostalgic atmosphere in calm. 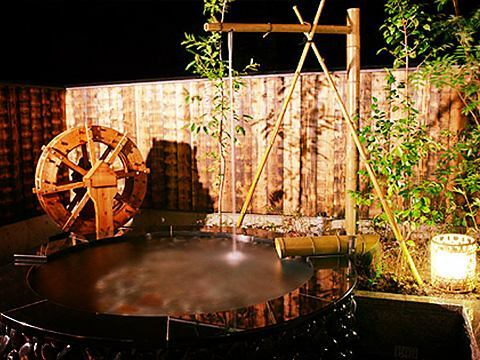 A gem of Dogo Onsen is engraved in the gate of a stone-made outdoor bath, and in autumn you can relax and enjoy Dogo-no-yu Dogo Onsen of Dogo Onsen while watching the colored maple. 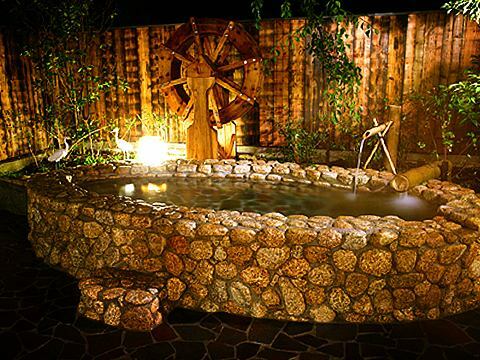 ※The hot water of the garden outdoor bath will be hot spring of drinking hot water of Dogo Onsen 100%. As the name of "No-no-yu", we are able to enjoy the flowers.You can enjoy the space at that time. Please enjoy encounter beyond the time of eternity. One hanging scroll, one flower, everything is in there seeking a meeting for the first term. Room 702 is familiar with the nickname of "No-no-yu", a room with a popular open-air bath, Dogo-kan. 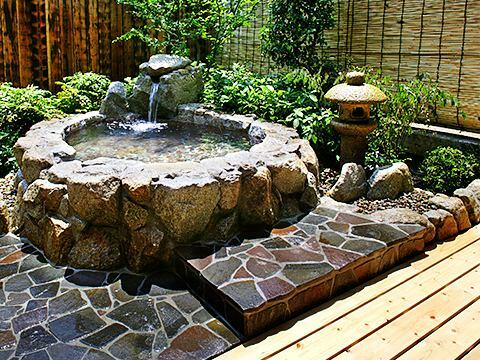 The outdoor bath is a circle made by combining stones, surrounded by greenery as its name suggests, you can enjoy various flowers every season. 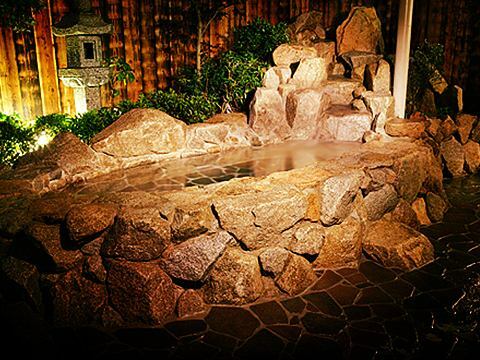 It is a garden that is enveloped in a gentle atmosphere while listening to the sound of hot water in the sinking. Comfortable, open-air bath made of wood.And it is the room of the ferns. Room Shidare-no-yu 703 is familiar with the nickname "Shidare-no-yu", the fern trellis is beautiful, the Dogo-kan is a room with a popular outdoor bath. 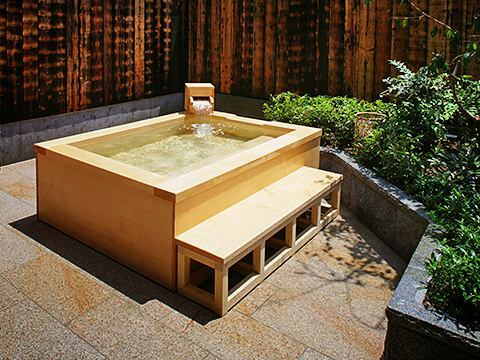 The outdoor bath of wood's gentle material is a comfortable feel, and it calms the feeling of entering.As the room is digging in the space facing the garden, you can have a relaxing time. Speaking of Ehime is a mandarin oranges.Please enjoy the rooms of Mikunzukuri. A story that creates together. A story called "I" that is spoken day by day.Why do not you leave Dogo-kan on that 1 page? 704, Room is nicknamed Mikan-no-yu, is Dogo-kan popular open-air bath with your room.The outdoor bath has a distinctive round shape with tiles on the outside, giving a gentle atmosphere. In addition to the regular table, there are digging trees where the inner courtyard and open-air bath can be found in the room, and you can spend a relaxing and warm time.You can enjoy the best moment while listening to the sound of hot water poured into the open-air bath. 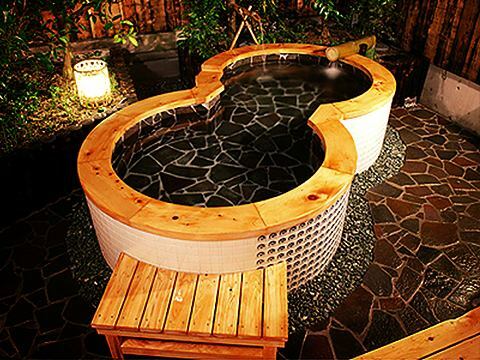 The open-air bath of a hexagonal wooden ship has sophistication and warmth. Thinking about months of the year, I follow. While immersing, remember history.Such a luxury. Room 705 is a room with a popular open-air bath, Dogo-kan, familiar to the nickname of "Kifune-no-yu". 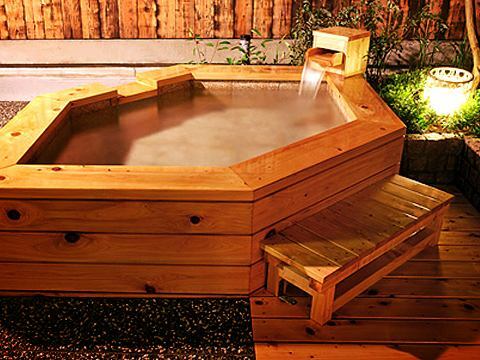 The outdoor bath is a hexagon that makes you feel the warmth enclosed by beautiful wood grain. Sarusuberi and Benikanamemochi, and the contrast of red and green is beautiful, and it is always one of the most popular rooms. Forget your everyday life, please enjoy yourself at ease. With the appearance of a yukata and with a good fit.Please feel the relaxed flow at different times. Room 706 is a room with a popular open-air bath, Dogo-kan, familiar to the nickname of "Hitashinoyu".The outdoor bath is a massive building with a solid feeling of the stone structure, and the hot spring of the dripping sink will fall from the bamboo set at the top.You can enjoy a relaxing space as if you are in the forest with objects and trees that imaged water mills. The theme is "autumn leaves" room. Together with the light of peace. Here is a lightly wrapped light like the moon, a place to relax. Room 707 is a room with a popular open-air bath, Dogo-kan, familiar to the nickname "Momiji-no-yu". The outdoor bath has become a refined stone even while there is a heavy feeling. Two kinds of maple are arranged on the left and right, and the contrast of red and green is beautiful in the garden.You can enjoy the colors of the season from the pleasant wood deck as if the wide edge continued to open-air bath. Why do not you spend your leisure while giving your thought to history? Room 708 is familiar with the name of "Shirasagi-no-yu", it is a room with a popular open-air bath, Dogo-kan.The outdoor bath is a combination of stones, and you can also enjoy the feel of stones such as unique roundness and texture. In the back of the open-air bath, we welcome small Kodemari and Aberia that can make many white flowers bloom in spring and Shirasagi named after Dogo-no-yu. 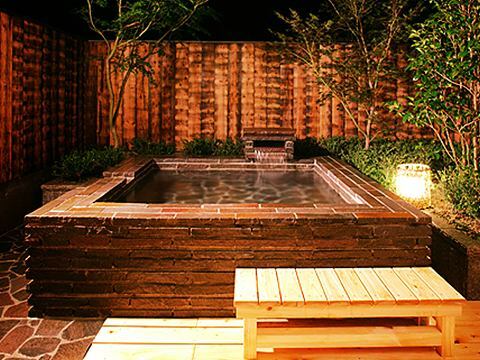 ※The hot water of the garden outdoor bath will be hot spring of drinking hot water of Dogo Onsen 100%.※It will be a non-smoking room. After enjoying the outdoor bath, please relax in the spacious room. A relaxing inn that you have reached. Here I am looking for a relaxing place I was looking for. Room 709 is a room with a popular open-air bath, Dogo-kan, familiar to the nickname of "Taki-no-yu".It becomes a special room even in the room with outdoor bath.There is a lounge where spacious sofas are placed in the wider inner courtyard. The outdoor bath is a stone work, and hot water flows from a gentle stone stairway reminiscent of the right hand valley.The appearance is reminiscent of the river babbling, you can taste the atmosphere as if you are holding a luxurious place in the deep mountain. Diet counseling, nursing services, medical service, lift-up seat with a courtesy car, Japanese-style room table chair seat, large bath stair lift, etc., As you can spend a pleasant moment in the Dogo-kan towards all of the hotel guests, also you not We are preparing various services so that there is no freedom. In addition, if you have any requests or concerns, please do not hesitate to ask us when making your reservation.